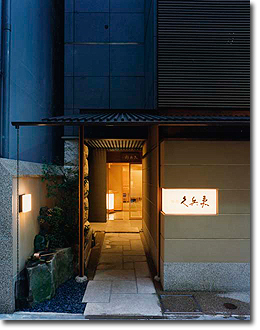 Kyubey Sushi, is famous as a top-class sushi restaurant in the city. It is so popular that it often turned away customers. To accommodate everyone they have opened a bekkan (annex) across the street. They are accustomed to foreigners coming in and you may be seated in front of an English-speaking chef. It is popular with Japanese as well as tourists. The sushi chef may ask you if he should change the size of the shari (rice) or the amount of wasabi. This thoughtfulness is especially appreciated by the ladies who lunch there who may want to have a little less rice as they may be watching their weight. Kyubey is a nice option if you are looking for a top quality sushi experience but want to avoid the prohibitive prices at some shops that are only open for dinner. The lunch here is very reasonable for classic Edo-style nigirizushi. My wife and I went to Kyubey in Ginza and it was the perfect experience for a tourist. The restaurant is beautiful inside, all the waitresses wear kimonos and treat you so well, they sat us in front of a chef who spoke great English and wanted to chat with us. The food was fantastic as well, as you would expect from a famous place like this, but we weren’t expecting the whole experience and it blew us away. Ginza Kyubey is my must visit recommendation for any of my friends who travel to Tokyo. Thanks again Yukari for telling us about it. Arigato, Marcus. So very happy to get your note. It truly is a special sushiya in Japan. Thrilled you made it there.